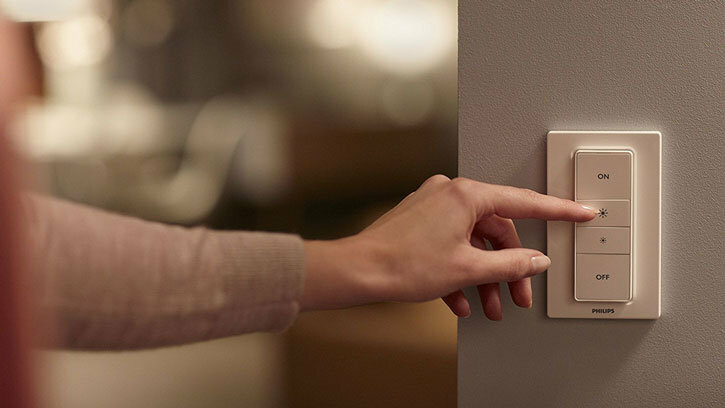 Control your Philips Hue lights with ease with this official wireless dimmer switch. Control which lighting scene is used, adjust the brightness and even detach the remote from the magnetic holder for ease of use. 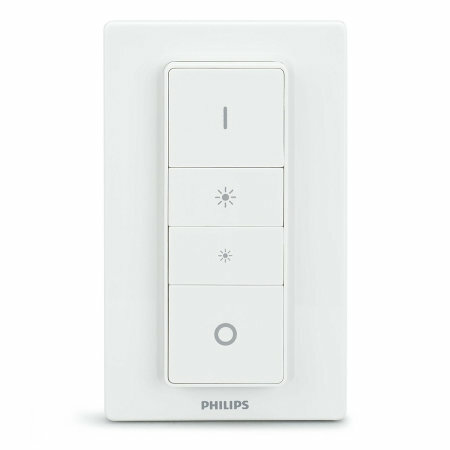 Paired with your Philips Hue Hub, you can control a single light or a group of lights all from this handy Wireless Lighting Dimmer Switch. With up to 5 pre-programmed scenes you can select and create from the official Philips Hue app, you can enjoy a variety of lighting presets to suit your mood no matter what the occasion - selecting them directly on this handy wireless switch. Maybe you desire a soft light for a romantic atmosphere, or a bright light for reading a book - you decide. 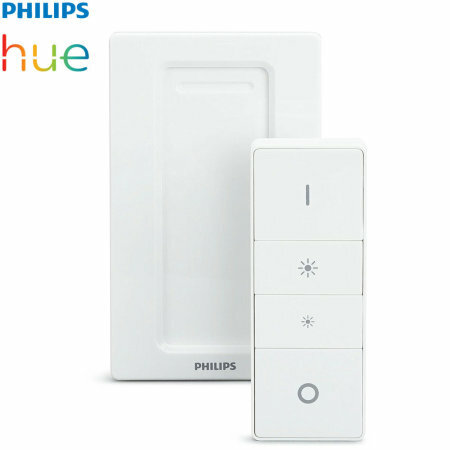 Even better, if you are yet to own a Philips Hue Hub, you can control an individual Philips Hue Bulb by directly connecting the Wireless Lighting Dimmer Switch to the one light for the perfect introduction to the smart home experience. Please note: Philips Hue Hub and lights not included. Gone are the days where we would go to all the trouble of installing a dimmer switch to our standard lights, only to hear an annoying buzzing noise as you reduced the brightness. Using this Official Philips Hue Wireless Lighting Dimmer Switch paired with a Philips Hue Hub or an individual bulb, you can digitally adjust the brightness levels without any of the nonsense. It simply works! Simply select for more brightness or less and watch as your light or group of lights adjust to match your needs. 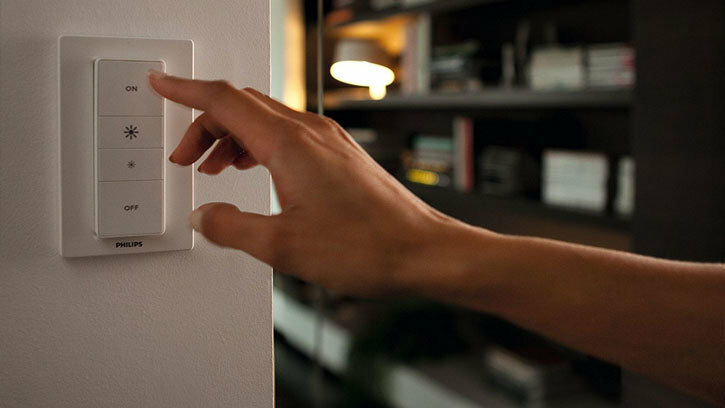 You are sat all comfortably or laying in bed and the urge to adjust the lights usually means getting up and walking over to a wall to trigger a switch. Forget this retro nonsense and instead use this handy remote switch. 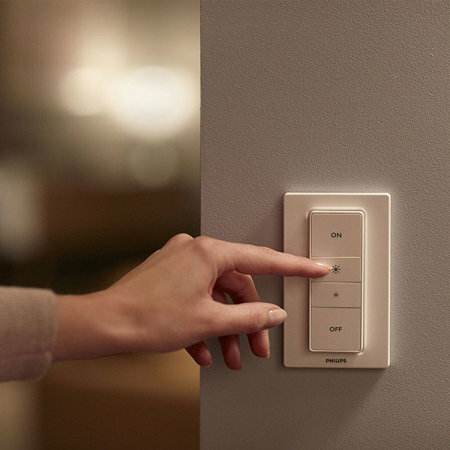 Yes you can remove the switch part away from the magnetic panel, which turns the unit into a remote control for your lighting. Place the remote by your bedside, chair or wherever you like - for the ultimate in lighting convenience. Not an electrician? 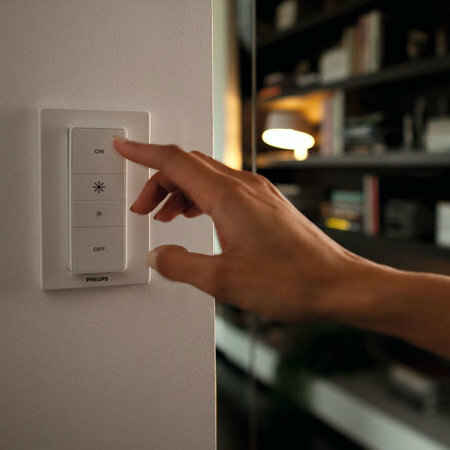 Well there is absolutely no need to worry as installing the Philips Hue Wireless Lighting Dimmer Switch couldn't be simpler. No wiring knowledge required as, well there are no wires to worry about at all! Simply attach the unit to the wall in a location that is suitable for you either by using screws or even easier the sticky pads provided. Pair with your Philips bulb or hub and you are done, as easy as that. As this is an official Philips Hue accessory, you can be sure of perfect compatibility - making this the perfect Philips Hue companion to your lighting collection.